Even before yesterday's incredible volley goal by Jamie Vardy and the 2-0 win over Klopp FC, Leicester City were a very closely followed story for those that live and breath football. With today's financial impact in the modern game underdog stories are far and few in between and the intrigue of how long the club can keep this going is growing larger each week. After all, talking about the East Midlands club atop of England's first tier in the month of November is not quite the same as Leicester's three point lead now on February 3rd. So, as the "can they?" chatter intensifies, I take a look at five reasons why Leicester City winning the league would in fact be great. From Jamie Vardy's rise to glory to Ranieri's return as a Premier League manager after more than a decade, it's absolutely indisputable that watching sports news after the fact will get tiresome pretty quickly. Nonetheless, the story of Leicester City winning their first top tier title in the club's 132 year history would be huge! In just two seasons since their promotion back to the Premier League, The Foxes have a chance to make an impact of historic proportions on the EPL; one that will be covered by football news outlets well into the 2016-17 season. The club had spent some money in recent seasons, but the £7 million acquisition of Japanese striker Shinji Okazaki, or the £9 million transfer fee paid for Croatian Andrej Kramarić the year before will hardly be seen as big transfer window "splashes" when compared to the likes of the usual EPL title contenders such as Chelsea, Manchester City and the like. As a matter of fact, Leicester's total player worth at the moment is estimated to be at around £72 million, which is only good enough to surpass newly promoted sides Norwich, Bournemouth and Watford, and is nearly twice less than the value of the currently relegation seeded Newcastle United squad. "Big money" in modern sports wins on most occasions, but if The Foxes were to win the league this year it would (at least for one year) turn that notion around. Perhaps not so much the fans of Arsenal or Manchester City who are still in the title hunt, but Leicester's win would definitely make this season a bit easier for the supporters of Liverpool, Manchester Unites and Chelsea (and perhaps even Tottenham). After all, when you know there's pretty much no chance for your club to win the league, a nice "Cinderella story" is a better alternative to seeing your bitter rival winning the league title. As is the case for the fans of Chelsea and the like, supporters for all other clubs (well, perhaps not Aston Villa) can begin the 2016-17 campaign with much more than the usual anticipation. After all, if Leicester wins the league "so can we". A shock title for the East Midlands club would raise everyone's hopes, perhaps even mine, a bitter Toon supporter. 5 - Jamie Vardy & Co.
Jamie Vardy is a story all on its own, but is not the only roster highlight on the team. Vardy's season has been so far nothing short of spectacular and the league goal scoring leader has already Hollywood screenwriters following him around in an attempt to write the story about the boy from Sheffield. But if The Foxes were to win the league it would definitely not be for the lack of quality footballers who indeed deserve to win the title for the quality of their play this season. The acquisition of Algerian international Riyad Mahrez from French club Le Havre two seasons ago proved to be crucial to the club's recent run, as did the purchases of defenders Robert Huth from Stoke City and Danny Simpson from QPR (among others). But the ability to keep and develop youth players has also paid off for Leicester. In 2011 City acquired 24 year old Danish keeper Kasper Schmeichel, who had developed into a Premier League goalkeeper quite nicely and had featured for The Foxes in almost 200 matches to date. Once a Manchester United prospect 25 year old Danny Drinkwater has been at Leicester since the age of 22 and is also slowly coming into his own. Also, 27 year old Welshman Andy King has been with the club his entire senior career and impacts whenever he is called upon. 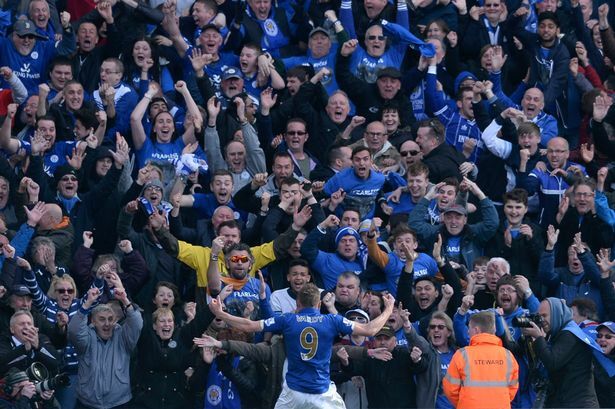 Leicester City winning the Premier League title this year would be incredible! Aside from actually deserving to raise the trophy for their impressive performances alone, a Foxes season victory makes so much sense on so many levels; a shock EPL season I for one would love to experience.